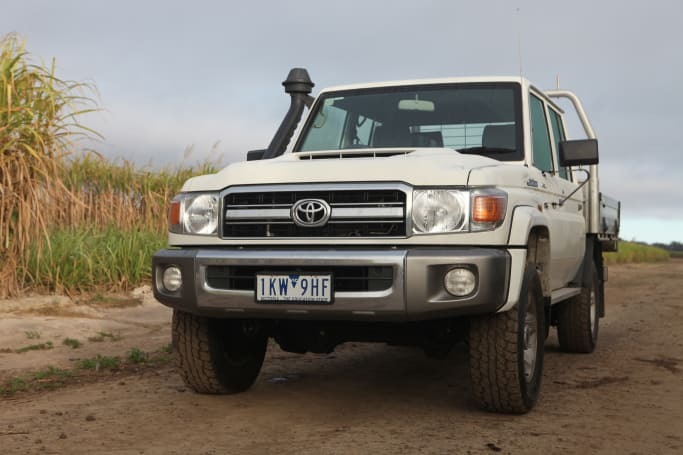 Toyota’s 70 Series models are dead-set bush legends and the 79 Series ute has continuously shown itself to be near-indestructible as a farm tool and go-anywhere off-road tourer, pretty much able to be driven straight out of the showroom and into the wild. It has a huge following of brand-loyal fans due to its no-nonsense looks, quality engineering and long-term reliability. Despite continued anxiety in the traditional 4WDing community about Toyota’s potential decision to do away with the 70 Series, rumors of its discontinuation have so far been proven false. In a world of increasingly gentrified utes with cutting-edge driver aids, car-like ride and handling and offering supreme levels of comfort and convenience, does the 79 Series even deserve a spot in the modern ute market? Read on. 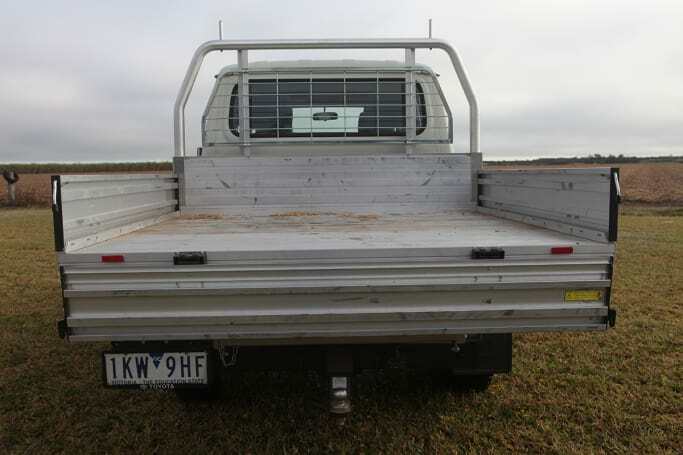 This 79 Series dual cab GXL usually costs $71,740 (cab chassis only; excludes on-roads) but our tester has the heavy-duty aluminium drop-side tray, towbar and wiring kit, and Redarc electric brake controller, so actual price would likely be more than $75,000. 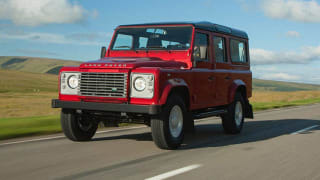 Compared to any of its rivals, the 79 Series is a bare-bones unit with a few trimmings including chrome grille, bumper, roof drip-rails, and snorkel. This 79 Series dual cab GXL usually costs $71,740. Air-conditioning, power windows and cruise control are standard on the GXL. It has a lockable glove box, a two-speaker audio system with AM/FM tuner, USB audio input for iPod/MP3 players and a MP3 compatible CD player with Bluetooth capabilities, 12-volt power socket. Word of warning: don’t go looking for vanity mirrors because there are none. It does have Active Traction Control with ABS, though. In a market full of easy-on-the-eye, streamlined city-centric utes the 79 Series may be regarded as a bit of an ugly beast – but ugly, in the realm of real-world workhorses, is a blessing in disguise. The 79 Series is tall and boxy with squared-off, sharp angles everywhere. At the front, the pronounced bonnet bulge caps off what really is a traditional work truck appearance: tough and functional with few obvious concessions to comfort. 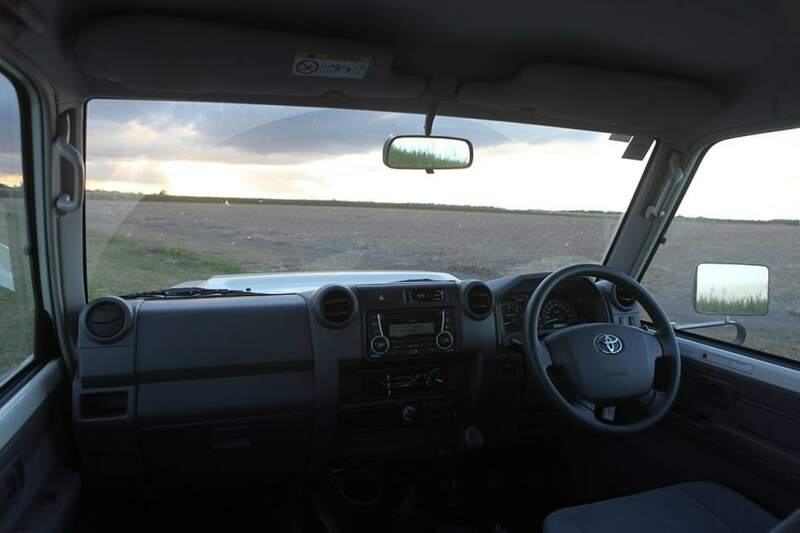 The interior is basic even in top-spec GXL guise – big, no-frills dash, hard-wearing but comfortable cloth seats and small storage spaces – but being basic and ready for work is a considerable part of this ute’s overwhelming appeal. There’s no flash or frippery in here. I’m a big fan of grab handles and those are at all doors in the 79, so that fact gets a huge tick of approval from me. The front seats are surprisingly comfortable, given they don’t look like they’d be especially nice perches for long-distance travel. The rear seat is a bit more straight up and down, but after more than 1500km on them our rear-seat passengers (both under 10) had uttered no complaints – about the seats anyway. The rear seat is more straight up and down, but our rear-seat passengers had no complaints. Our tester had removable rubber all-weather floor mats up front (one for driver and passenger) and in the rear (one big mat that stretches across the entire floor) – these mats are available as Toyota Genuine accessories. 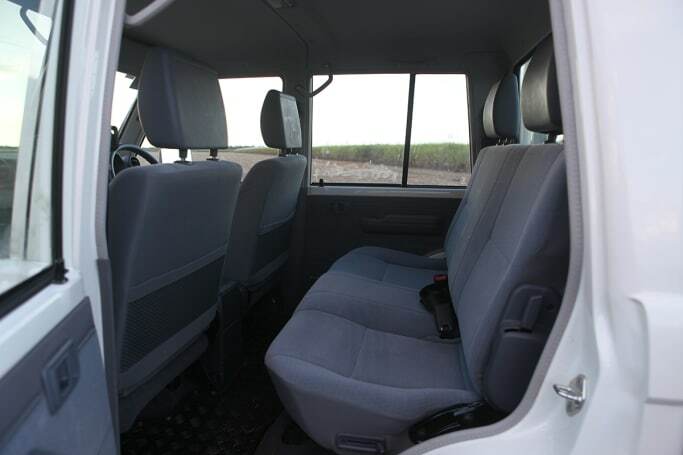 Storage space is on the spartan side of things with a shallow glovebox and centre console, skinny hard-plastic door pockets, and slim seat-back soft pockets. There is some space behind the rear seat, if you flip that forward, but it’s not a whole lot of room; space enough for soft bags only. 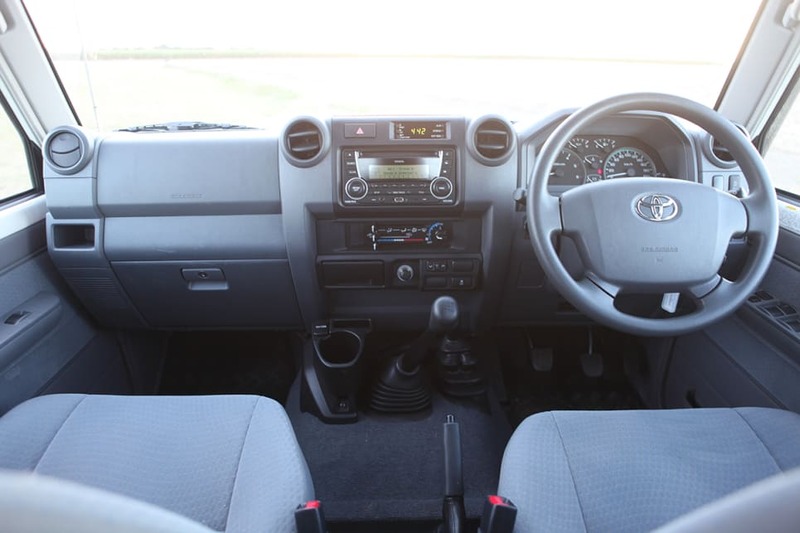 The interior is plain but well designed, with all controls prominent and easy to operate, even while traversing chopped-up country backroads or the worst of bumpy off-road terrain. Another positive from the 79 Series’ up-and-down styling is plenty of head, arm and legroom for everyone. There is some space behind the rear seat, if you flip that forward, but it’s not a lot of room. The engine bay has an easy-access accessory fuse box, making it handy for tourers, who love to plug in accessories for camping trips. Our tray had a metal-grille window protector, below-tray rails down the side, and rubber backing at the tray’s latch-points. The tray is pretty shallow though – more about that later. 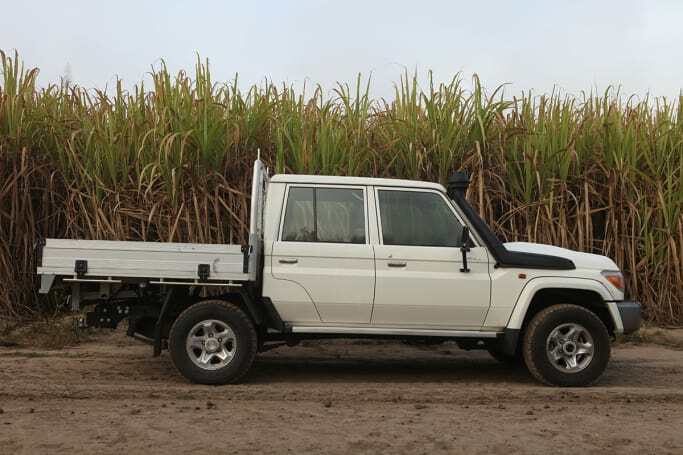 Towing capacity is listed as 750kg (unbraked) and 3500kg (braked). The 79 Series has a Euro-compliant 4.5-litre turbo-diesel V8 engine – producing 151kW at 3400rpm and 430Nm from 1200-3200rpm – and a five-speed manual gearbox. The five-speed manual now has taller gearing in second and fifth gears than in previous 70 Series line-ups. 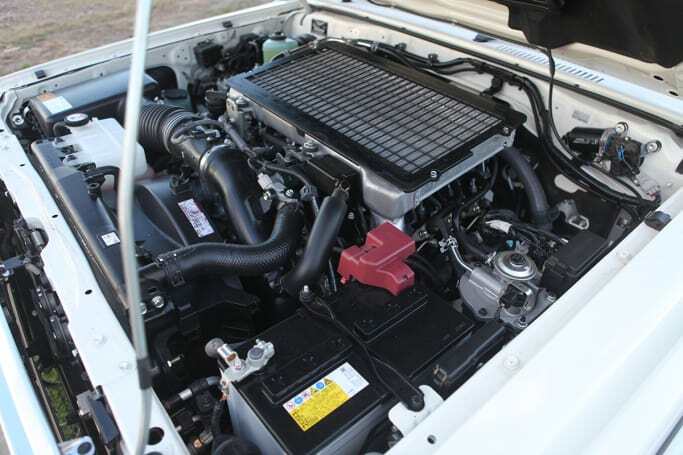 The 79 Series has a Euro-compliant 4.5-litre turbo-diesel V8 engine. A long-distance test can yield as many telling results as a long-term test because it tends to reveal things a journalist may otherwise not get the chance to experience over journeys or test periods of shorter duration. From the start those front seats were very comfortable – and, that’s from real touring experience, because we spent a lot of hours in them on the way to and from south-east Queensland. We spent the majority of our time on bitumen, some of it of poor quality, with considerable time on dirt and gravel roads. We spent a considerable amount of our time on dirt and gravel roads. Visibility out of that tall and boxy cabin, especially from the upright driver’s seat, is great. The engine was rarely stressed, except when pushed hard beyond the 2800rpm mark, and that tweaked manual gearbox – a marked improvement over the previous one – makes for solid delivery of power-on speed and nice cruising on open roads. You can take off comfortably in second gear – it’s actually preferable because first gear is so short – and taller gearing in second and fifth give you plenty of flexibility in the rev range. You never forget what you’re in while driving the 79 Series because its ride quality, while softer and more comfortable than in previous versions, is still on the wrong side of harsh, but that’s no surprise as it has live axles front and rear and leaf-spring rear suspension. Thing is, you swiftly get used to it. From the start the front seats were very comfortable. Visibility out of the tall and boxy cabin, especially from the upright driver’s seat, is great. Some less-than-ideal factors revealed themselves to us during long-distance travel though: the 79 Series exhibited quite pronounced understeer around even the slightest of corners; while NVH levels seem more subdued than before, there’s still quite a lot of wind-rush howling over the A-pillar-mounted snorkel and those big wing mirrors at speed; and this ute's 14.4m turning circle does not suit easy, swift moves in suburbs or the city. 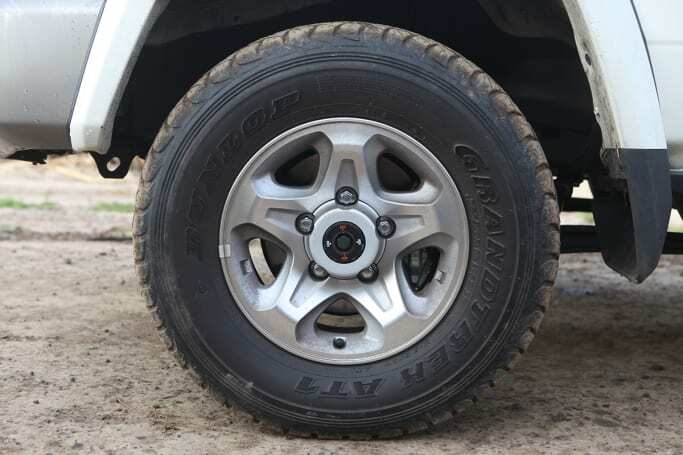 The 79 Series has 16-inch alloy wheels shod with Dunlop Grandtrek AT1 260/70R16 115R LT (Light Truck) tyres – perfectly fine and grippy on dirt roads and never too noisy on bitumen. No breaking news here: the 79 Series is a real champion off road – you know it, I know it. As mentioned, it’s one of a select few 4WDs that could be driven straight out of a dealership and join a hard-core bush excursion without pause. Its all-terrain tyres are the weakest link in the 79 Series’ off-road armory. 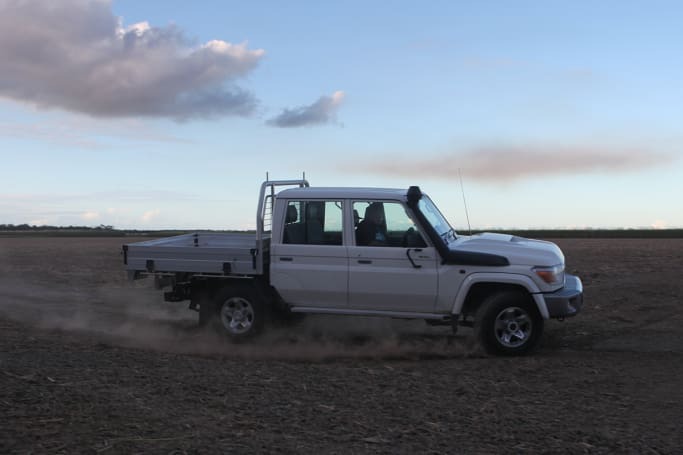 The GXL is not small – it is 5230mm long (with a 3180mm wheelbase), weighs 2316kg (including the optional alloy tray) and has that big 14.4m turning circle – but it still manages to feel at least a little bit manouvrable on dirt roads and squeezy cane-paddock tracks. Its all-terrain tyres are the weakest link in the 79 Series’ off-road armory. 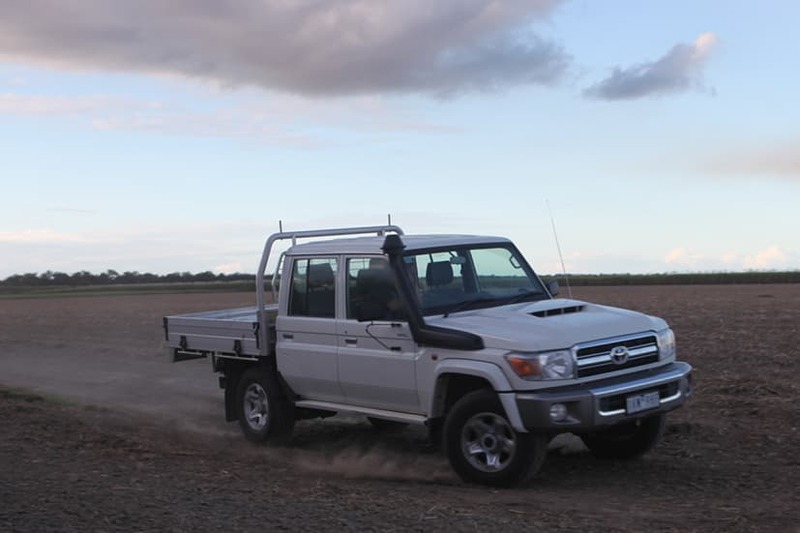 In a world of Terrain Response, Terrain Management, and 4WD systems that can all be engaged at the press of a button, it is refreshing to have to switch between high- and low-range using a traditional 4WD stumpy gear stick. The 4WD system is still a part-time dual-range one, but the 79 now has auto locking hubs, rather than the manual kind. We’ve had this thing on extreme terrain before – severe mud tracks, steep shale hills, top-of-tyre-deep creeks (it has a 700mm wading depth) – and the 79 has always tackled everything without missing a beat. This time we went a bit more gently on it – farm tracks with soft coastal sand and hard caked-mud ruts were the worst of it – but the 79 Series just kept on trucking, no matter what. The ute’s engine braking is rock-steady; on previous trips we've crept down steep downhill runs – feet off all pedals – in complete control. Hill-start assist control has also proven its worth. Front and rear diff locks are standard on the GXL dual cab. Some people whinge about the 79's different wheel tracks (1555mm at the front, 1460mm at the rear) claiming that that set-up impedes them on a variety of terrain, especially sand, but simply adjust your driving style and stay aware, and that'll go a long way to ironing out a lot of the problems you're likely to face as a result of those mismatched tracks. A downside for touring was the shallow alloy tray, which limited how much we could load. 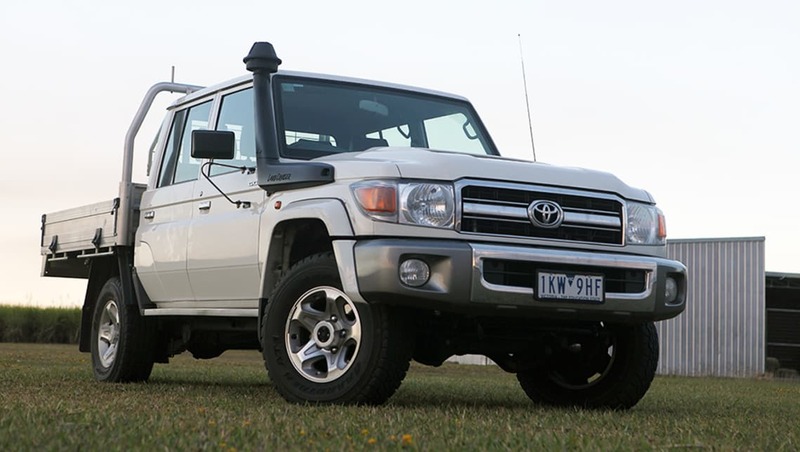 The Land Cruiser 79 Series has a 3500kg maximum braked towing capacity (with a maximum 350kg on the towball). Its GVM is 3300kg; GCM is 6800kg. A downside for touring, as we found out during the process of packing, was the 79's shallow alloy tray, which limited how much we could actually load into the tray; it simply doesn't have the depth of a Ranger, HiLux or Navara. The 70 Series is claimed to use 10.7L/100km (combined) and 9.4L/100km (highway). Our best independently recorded figure was 10.18L/100km (82.94L used over 814.4km) from mostly open-road cruising; our worst was 13.56L/100km (95.05L used over 701.0km), which mixed in highway duties, country roads, some load-carrying (swag, family luggage, etc) and light-to-moderate 4WDing. It has a 130-litre fuel tank. Only the single-cab 79 Series ute has a five-star ANCAP safety rating; the rest of the range, including our dual-cab GXL, remain untested/unrated. 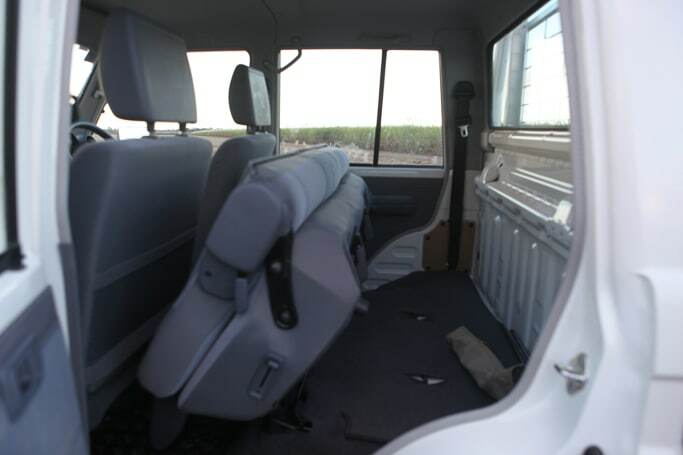 The dual-cab has dual front airbags and ABS as standard. The safety pack includes vehicle stability control, active traction control, hill-start assist control, brake assist and electronic brake-force distribution and more. The warranty is three years/100,000km. Services are scheduled for every 10,000km, with the cost capped at $340 a pop. 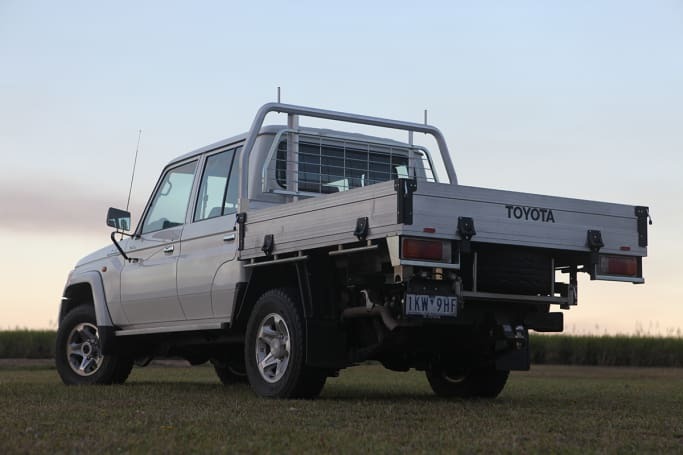 The 79 Series is the ute you’re looking for when you’re not looking for a modern ute. It’s old school through and through, and it plays superbly well to its strengths – robust, capable and reliable – but doesn't necessarily give a rat’s a#@e about its weakness, perceived or actual. It’s sorely lacking in the safety stakes, there’s no denying that, and it makes few concessions to comfort that its rivals do as standard and, sometimes, much cheaper. But part of the 79’s charm is its rough-as-guts arrogance about what it can do and how entirely unrepentant it is about the stuff it can’t do and the modern conveniences it doesn't have. What do you think of the 79 Series: is it old-school cool or simply cruel? Tell us what you think in the comments section below.